Quality Coils Inside: We include two corrosion-resistant coils in every NuTone packaged system. Multiple-Stage Comfort: This packaged air conditioning model features two-stage cooling for more consistent temperatures and greater dehumidification capabilities. Compressor Noise: We reduce noises associated with operation with a compressor sound blanket in every unit. Premier Packaged Efficiency: This packaged unit is efficient and green. It meets NuTone requirements for ecoLogic® rated equipment. High-Efficiency HVAC: This unit’s ENERGY STAR designation (in certain sizes) means it is high efficiency. High-efficiency packaged equipment may help you reduce operating costs (when upgrading from an old unit). Complete Unit Protection: We use a wire coil guard and a never-rust mesh hail guard to protect the coil from damage caused by things like balls, lawnmowers, hail and more. Electric Heating Backup: Achieve ultimate peace of mind with the option of an electric heat strip for backup heat. This provides 20 kW of backup heating power. Tough Exterior Protects Crucial Components: Durable and resists corrosion. Includes a galvanized steel outer shell coated in a corrosion-resistant, polyester-urethane finish. Built with Quality in Mind: Packaged equipment at NuTone is checked 72 times before leaving the factory. Operates at Low Noise Levels: Unit includes a 24-inch swept-wing fan blade, custom venturi condenser fan and compressor sound blanket for ultimate sound reduction. Expertly-Designed Coils: We fight problems with corrosion with resistant coils. NuTone packaged equipment contains advanced coils. Total Home Comfort: This model offers four-stage heating and two-stage cooling performance. This, paired with a variable-speed motor, provides greater home comfort and extra-quiet operation. Two Fuel Sources for Energy Savings: The dual-fuel NuTone iHybrid heats with electric heat when temperatures are mild, and with gas when temperatures are colder, to reduce utility bills. Smooth Operation and Efficiency: ecoLogic® products deliver when it comes to energy savings and premium home comfort. This dual-fuel system qualifies because of its energy-efficient performance and home comfort technology. Long-Lasting Steel Exterior: A galvanized steel outer shell coated in a corrosion-resistant, polyester-urethane finish protects the interior of the unit. Quality Assurance Practices: Checked over for the best quality - 72 times in total. 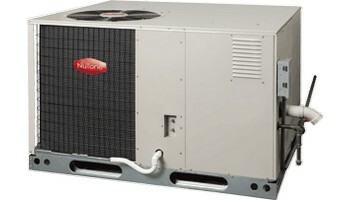 The NuTone iHybrid series offers complete home comfort year around. Dual-fuel technology uses both electric and gas to provide warn AND cool air throughout the year in one packaged system. This unit quiet and efficient - reach 15 SEER, 8 HSPF and 81% AFUE efficiency. Ask your contractor if your home could benefit from this heating and cooling system.